WHEN LOT SELECTEDthe fertile plains of Jordan for his share of Canaan‘s land, he thought he was making a wise choice. He saw in the distance the large cities of the plain, called Sodom and Gomorrah. He knew that in those cities he could sell sheep and cattle from his flocks and herds, and soon have much silver and gold. So he moved toward Sodom. After a while he pitched his tents still nearer the city walls, and finally he moved his family inside the gate. Now, Sodom was not a nice place for good people to live. The people of Sodom cared nothing about God. Some of them were very rich, and perhaps they had beautiful homes. But they had unlovely hearts.The Bible tells us that the men of Sodom were wicked and great sinners in God’s sight. But in Lot’s sight they were rich men, and clever, and so he brought his family to dwell among them. This was a sad mistake. One day trouble came upon Sodom. There had been war in the land and the kings of Sodom, Gomorrah, and three other cities had gone out to battle. The army against which they fought defeated them. Then the conquering soldiers entered the gates of Sodom and of Gomorrah, crowded through the streets, and pushed their way into rich men’s houses, taking everything that they could find to carry away. They even took people and led them away to become slaves. And Lot with his wife and children were taken with the others. One of the captured men escaped and fled across the country to the place near Hebron where Abram lived. He told about the battle and what had happened to Lot. 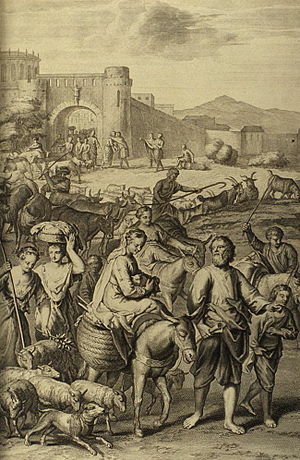 When Abram heard of Lot’s trouble, he took three hundred and eighteen of his men servants and, with some friends, hurried in pursuit of the captives. After a long, hard march across the country they came upon the enemy’s camp at a place in the north of Canaan, called Dan. It was night, and the unsuspecting enemies lay asleep. Abram and his men rushed upon them and frightened them. They thought a great army had come to fight against them, and they were not prepared for a battle. So they rose up in haste and ran away, leaving behind their tents and all the goods and the people which they had taken away from Sodom and Gomorrah. This was a great victory for Abram. The people of Canaan honored him for his courage, and the king of Sodom went out to meet him. He offered Abram all the gold and silver and food and clothing that he had taken away from the enemy’s camp, and asked only that the people be returned again to Sodom. But Abram would not accept any reward from the king, because he had promised God that he would not keep anything for himself. And so all the people and their possessions were again returned to their homes. 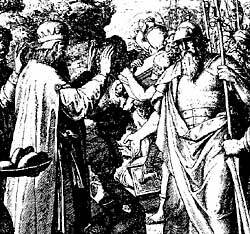 Because Melchizedek was a priest of the true God, Abram gave him a tenth of all the goods he had taken from the enemy’s camp. This entry was posted in Discipleship and tagged Abraham, Abram, Canaan, Christ Jesus, Christianity, God, Ishmael, Jesus Christ, Melchizedek, Sodom, Sodom and Gomorrah, theology. Bookmark the permalink.